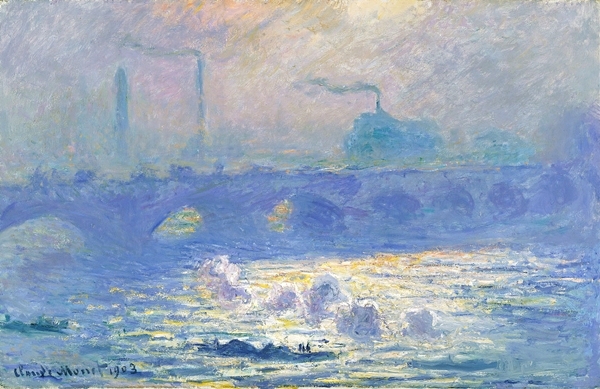 Another work from Claude Monet’s Waterloo Bridge series, from 1903. Claude Monet‘s Waterloo Bridge, London (1903) is the latest famous canvas recovered from Cornelius Gurlitt’s hidden stash of priceless artwork, AFA News reports. The long-lost masterpiece is part of a series the artist did on the subject between 1900 and 1908. The latest find comes from the reclusive 81-year-old’s third residence in the town of Bad Aussee, in Austria’s Styria region. The 180 artworks include a bronze Pierre-Auguste Renoir sculpture and drawings by Paul Gauguin, Paul Cézanne, and Pablo Picasso. German authorities seized 1,280 works from Gurlitt’s Munich apartment in February 2012, and recovered an additional 60 pieces from a second property in Salzburg, Austria. At at 2007 Christie’s auction, a similar 1904 Monet from the Waterloo Bridge series sold for £17.9 million ($35.5 million). An early estimate from the Independent pegs the value of the version just recovered in Austria at £8 million ($13.3 million). Investigations by the Monuments, Fine Arts, and Archives division of the US Army, whose wartime activities protecting European cultural sites and recovering art looted by the Nazis were the subject of the recent George Clooney film, cleared Hildebrand of any wrong doing. Intriguingly, the Gurlitts’ Bad Aussee home, which appears to have been used as a major storage facility by the family as recently as 2012, is quite close to the Altaussee salt mine where the Monuments Men recovered 6,000 stolen artworks hidden by the Nazis. Although Gurlitt initially maintained his legitimate ownership of the entire collection (see the artnet News report on his official website), he has since promised to return artwork that can be proven to be Nazi war loot. Several pieces have already been the subject of lawsuits from the descendents of the original owners, including a 1901 Max Liebermann canvas. Germany’s Städtische Museum Mainz has also laid claim to 56 of the works held by Gurlitt.